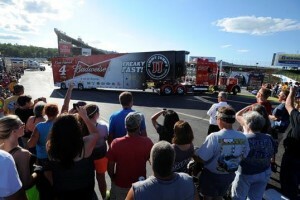 New England’s largest sports and entertainment facility will host five NASCAR races in three days this weekend. And while the on-track action is sure to be hotter than ever, there will be plenty of cool amenities and activities for families to enjoy. 1. 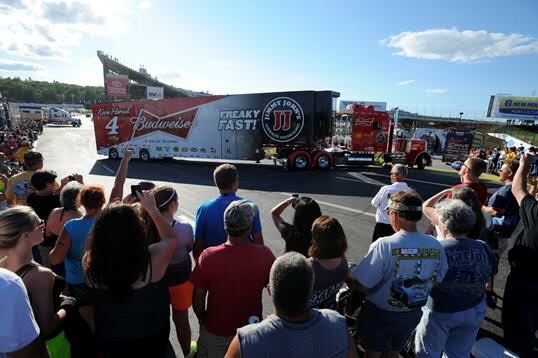 It All Starts Here: The ultimate fan experience, FanFest kicks off with the NASCAR Sprint Cup Series Hauler Parade at 6:15 p.m. on Thursday, July 16. This is the perfect start for the NASCAR weekend, as the massive haulers carrying driver’s cars enter in a train formation into the infield tunnel. Fans and families are able to line the sides of the road leading into the tunnel, where they can wave and get the hauler pilots to blast their horns. But that’s not all! After all the haulers enter, fans file into the Fan Zone, where they listen to live music, headlined by country music artist Tim Duggar, and check out the new 25th Anniversary Timeline, depicting unforgettable moments throughout the Magic Mile’s rich history. If that isn’t enough, the event will be attended by NASCAR drivers, who will take part in Q&A sessions with fans, as will Miss Coors, Miss Sprint Cup and Miss zMax. And it’s all free! 2. NBC Sports Bumper Cars: To kick off its 10-year partnership with NASCAR, NBC Sports has launched a national tour to offer fans a chance to get behind the wheel of classic bumper cars and race pedal-to-the-metal on a custom track. However, unlike what will be taking place on the Magic Mile, there are no rules here. The term “Rubbing is Racing” will be taken to a whole new level as fans and families enjoy an intense yet safe battle. 3. Actors, Artists and Athletes, Oh My! : Obtaining a pre-race pit pass has never been more valuable. The $50 pass, which allows fans access to the frontstretch prior to the NASCAR Sprint Cup Series 5-hour ENERGY 301 will have an opportunity to see superstar rocker Bret Michaels perform the pre-race concert, Boston Red Sox Hall of Fame shortstop Rico Petrocelli deliver the invocation, New England Patriots Super Bowl winner Rob Ninkovich before he gets behind the wheel of the official pace car, and New Hampshire native Adam Sandler deliver the most famous words in motorsports, “Drivers, start your engines!” Oh, and the opportunity to see every driver in the 5-hour ENERGY 301. No big deal. 4. Zip-a-Dee-Doo-Dah: So popular in its first go around last year, guests of New Hampshire Motor Speedway will once again have an opportunity to zip-line. The inclined cable, which involves a suspended harness and pulley system, will be available for families behind the F.W. Webb Bath House all weekend long. Just make sure if you’re waiting for a shower, you don’t end up in line to go zipping across property. For those looking for cool views at a slower descent, there will be a Ferris wheel that seats up to six in the Fan Zone. 5. What’s App-ening: New Hampshire Motor Speedway has updated its mobile app to become more seamless, user-friendly and interactive. Families can now use the app to find out the latest and greatest things to do while they’re here on property, as well as receive real-time updates on changes to schedules, parking, driver appearances and fan events. Signing up is easy with new and improved log-in features that let fans automatically sign in through Facebook, Twitter and email. 6. Now DAS Cool! : With the help of Verizon Wireless, New Hampshire Motor Speedway has improved its network through the installation of a Distributed Antenna System (DAS) that will soup up network services for the more than 100,000 racing fans attending NASCAR Weekend at NHMS. The DAS system will provide families with a much more reliable network to send/receive messages, photos and videos via their wireless devices. 7. Much Appreciated: For the adult members of families that need a night to themselves, the Camper Appreciation Party on Friday, July 17 from 7-9 p.m. is the place to be. There will be $1 draft beers and $1 hot dogs, while former Boston Bruin turned radio personality Lyndon Byers from the WAAF Morning Show will have giveaways for fans, play music and games, and much more. All proceeds benefit Speedway Children’s Charities. 8. Going Extreme! : What’s a race weekend without some … snowmobiles? That’s right, Evolution of Extreme is a group of adrenaline-fueled daredevils in an all-out battle against gravity. Fans can watch these record-setting gold medal riders on everything from BMX to motocross bikes to a back-flipping snowmobile. This stunt show is put on by Monster Energy and will take place next to the zip-line in the Fan Zone. 9. Drive the Magic Mile: Those arriving a bit early to the Magic Mile have the opportunity to pack up the minivan and take it onto the Magic Mile with the Laps for Charity, benefiting the New Hampshire Chapter of Speedway Children’s Charities. The event, which allows families to take their personal vehicles onto the track, will be held from 5-7 p.m. on Wednesday, July 15. The ride will consist of three laps around the track for a $30 donation. For $10, those who want a family selfie or standard photo in Sunoco Victory Lane can do so with a $10 donation. 10. Personalized Coca Cola: Families looking for a memento can stop by the Share A Coke Kiosk in the Fan Zone for a free 3 oz. sample of their favorite Coca-Cola products as well as a personalized can.